Christian Voices performed a new play for Christmas, 2015 – Another Way Home. When King Herod hears the news of a new King of Israel being born how does this affect him and what of the people in Bethlehem? 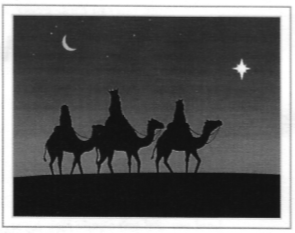 The Wise Men are an important part of the Christmas story, indeed often providing many a child a role in the annual Nativity narratives. But it is these travelling rulers that bring the troubling (for him) news of Jesus’ recent birth to King Herod the Great. What on earth could Herod, a tyrannical monarch with many questioning his right to rule, make of a new King? He himself would have many questions and all know the terrible “answer” he finds to his problem! But also there are the people of Bethlehem. Many would have been touched in the small town upon the birth of Jesus and the movement of people around Mary and Joseph. What could they have heard and what would they have thought of this news? In 2015 the short play was performed by Christian Voices on three consecutive December Sundays. The playwright, Alan Young, produced both the play and songs. the play is designed to be short enough to fit into most informal worship sessions.